THE SCENE: The 1856 Neill-Cochran House Museum recently hosted a benefit cocktail reception in the Museum’s Centennial Garden to honor Austin builder, contractor, and historic preservationist Joe Pinnelli with the Abner Cook Award. A capacity crowd celebrated Pinnelli’s long career in historic preservation and his dedication and careful recent restoration of the Neill-Cochran House. Supporters and guests enjoyed hors d’oeuvres from Word of Mouth Bakery, cocktails, wine and music performed by jazz band. THE VIBE: Luminaries in attendance included Texas Representative Gina Hinojosa, MariBen Ramsey, historic preservationists Tere O’Connell, John and Candace Volz, Julian Read, Courtney Hoffman, Peter Flagg Maxson, John Ritts and Maica Jordan from The Paramount Theater, Sonia, Sam and Sharon Wilson, Tyson Tuttle, Erika Herndon from the Friends of the Governor’s Mansion, Jan Bullock, Robert Green, Jonny and Brenda Jones. The Neill-Cochran House Museum is owned and operated by The National Society of The Colonial Dames of America in Texas. 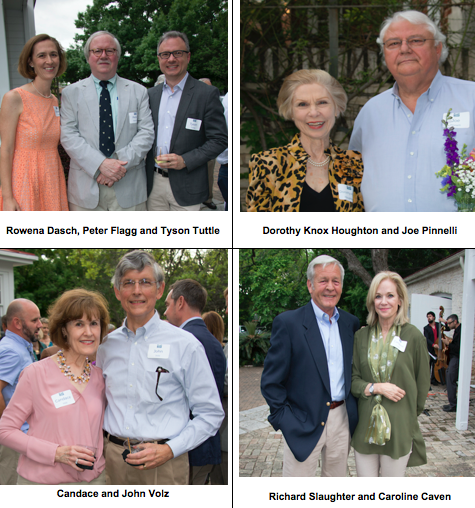 NSCDA-TX President Dorothy Knox Houghton and museum Executive Director Rowena Dasch welcomed guests, and Liz Maxfield, head of the Friends of the Neill-Cochran House Museum, presented the Abner Cook Award to Joe Pinnelli. Colonial Dames from Houston and San Antonio, including Dorothy Knox Houghton, Margaret Buescher, Linda Condit, Vereen Woodward and her husband Madison Woodward, Harriet Christian, Diana Morehouse, Fran Perez and her husband A.R. Perez also attended. THE CAUSE: The Abner Cook Award Reception is the largest fundraiser for the Neill-Cochran House Museum. This year’s event, co-chaired by Liz Maxfield and Caroline Caven, raised more than $40K in support of operations, programming, and preservation at the historic site. The museum offers extensive free family programming as well as lectures and concerts, and has just instituted new elementary and middle school initiatives designed to support and enhance Texas public school curriculum standards. Joe Pinnelli was named the 2017 Abner Cook Award recipient for his leadership in preservation. He was appointed by Governor Ann Richards to oversee the restoration of the Texas Capitol and served as the chairman of the Heritage Society (now Preservation Austin). Joe and his wife Janis, principals of the J Pinnelli Company, are considered to be the premier contractor for restoration of historic buildings.